With my limited experience in cruises (mainly overnight cruises from Destination A to B), I had expected nothing more than a pothole (for my view of the ocean) and a very cramped room (like the easyHotel room we had in London). Thus, Royal Caribbean Legend of the Seas Ocean View Stateroom was quite a pleasant surprise for me. The room was spacious (154 square feet) with 2 twin beds being combined to form a queen-size bed. The window provided a good view of the ocean and our room, being situated at the second deck (from the bottom) had a direct line of sight of anything that floats and swims in the seas (though we didn’t see anything interesting except yachts. The toilet was small – about the same size as a toilet in an airplane but with an attached shower compartment. Our “living room” is made up of a one-seater sofa, small TV and coffee table. There is also a spacious wardrobe where you can hang your formal, sports, leisure wear. 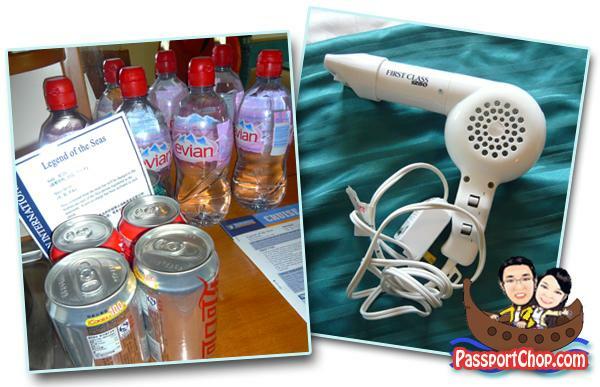 The “minibar” is neatly laid out on the table – US$4.55 for a bottle of Evian water. These took up most of the space of the dressing table – you will have to maneuver them around to make full use of the table. A hairdryer is also provided. I just found your blog through Bloggers Choice Awards and of course, had to see it for myself! Amazing, fantastic amount of information. Blog design is outstanding!! Good luck in the awards, you certainly deserve the recognition and will bookmark your blog to share with team members. Your travel information is a perfect companion for us all. I also own a adventure tour company in Nepal. I booked a similar cruise back in June 2010, using an OCBC credit card promo. 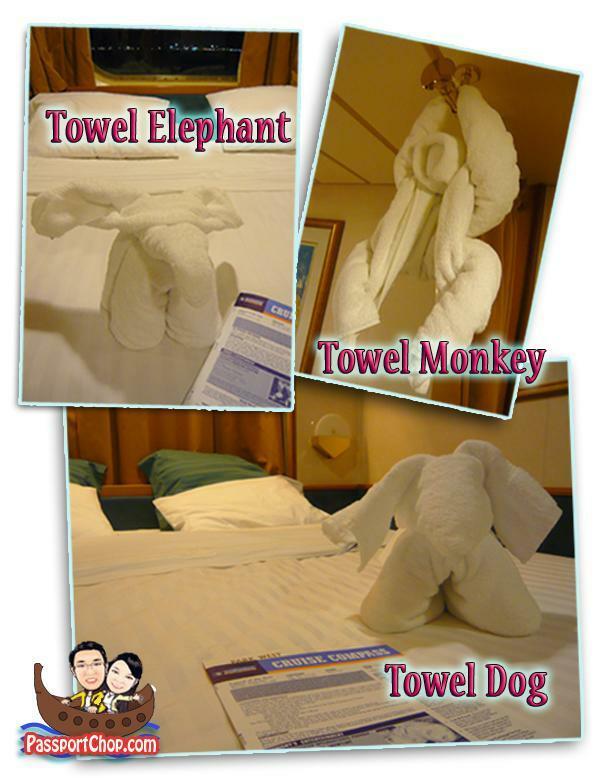 It’s a 6D5N Spices of Asia cruise, sailing from 28 Dec 2010 to 2 Jan 2011. The ports of call are Singapore-Phuket-Langkawi-Port Klang-Singapore. 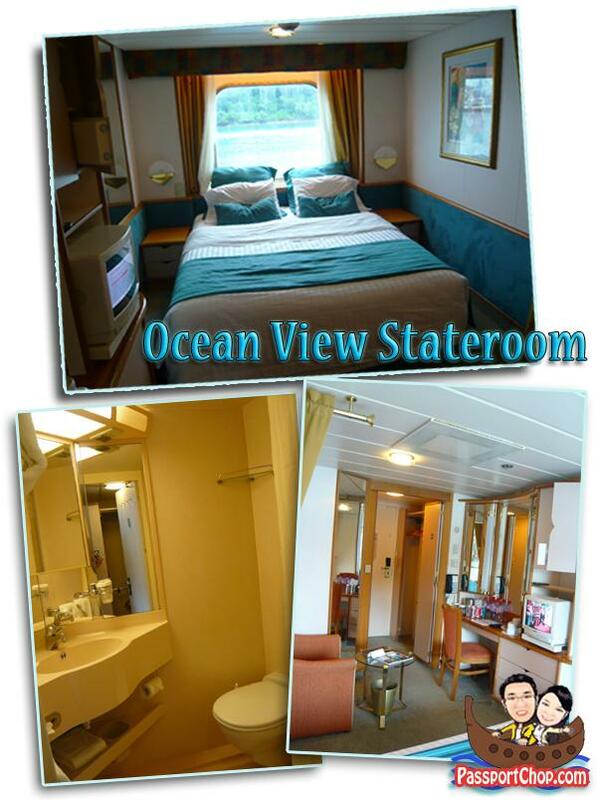 The cabin is a seaview stateroom for two pax, on deck 6. Now my husband tells me he cannot go, and I’m looking for a replacement. Is anyone interested? I’m willing to let go of this package at S$1100 per pax, i.e. S$2200 per couple. This all-in price includes GST, seaport taxes, gratuities etc. How much was the original package? $1100 per pax seems quite ex – is it negotiable? Dave, pl get in touch with Patricia directly if you are interested. Thanks, Zhiqiang & Tingyi! So far, do you have any friends who are interested? I want to ask about the room, is there any refrigerator in the room? Yes but a very small one.